Objective Interleukin (IL)-17A producing CD4 T-cells (TH-17 cells) are implicated in rheumatoid arthritis (RA). IL-6/STAT3 signalling drives TH-17 cell differentiation, and hyperactive gp130/STAT3 signalling in the gp130F/F mouse promotes exacerbated pathology. Conversely, STAT1-activating cytokines (eg, IL-27, IFN-γ) inhibit TH-17 commitment. Here, we evaluate the impact of STAT1 ablation on TH-17 cells during experimental arthritis and relate this to IL-17A-associated pathology. Methods Antigen-induced arthritis (AIA) was established in wild type (WT), gp130F/F mice displaying hyperactive gp130-mediated STAT signalling and the compound mutants gp130F/F:Stat1−/− and gp130F/F:Il17a−/− mice. Joint pathology and associated peripheral TH-17 responses were compared. Results Augmented gp130/STAT3 signalling enhanced TH-17 commitment in vitro and exacerbated joint pathology. Ablation of STAT1 in gp130F/F mice (gp130F/F:Stat1−/−) promoted the hyperexpansion of TH-17 cells in vitro and in vivo during AIA. Despite this heightened peripheral TH-17 cell response, disease severity and the number of joint-infiltrating T-cells were comparable with that of WT mice. Thus, gp130-mediated STAT1 activity within the inflamed synovium controls T-cell trafficking and retention. To determine the contribution of IL-17A, we generated gp130F/F:IL-17a−/− mice. Here, loss of IL-17A had no impact on arthritis severity. Conclusions Exacerbated gp130/STAT-driven disease in AIA is associated with an increase in joint infiltrating T-cells but synovial pathology is IL-17A independent. While cytokines including transforming growth factor-β (TGF-β), IL-6, IL-21 and IL-231 promote TH-17 effector functions murine TH-17 differentiation is dependent on TGF-β and IL-6.11 IL-6 stimulates cells through a non-signalling IL-6R α-chain and gp130, which activates signal transducer and activator of transcription 1 (STAT1) and STAT3, and represents the signalling β-receptor for IL-6-related cytokines.12 Mice displaying enhanced gp130-mediated STAT1 and STAT3 signalling, as a consequence of a phenylalanine (F) knock-in substitution of the cytoplasmic tyrosine (Y)757 residue in gp130 (gp130F/F mice) show exacerbated joint pathology in experimental arthritis.13 Here, disease was linked to gp130-driven STAT3 and was associated with increased synovial T-cell production of IL-17A.13 However, the role of gp130-mediated STAT1 signalling during inflammatory arthritis is ill defined. STAT1 activity often counteracts STAT3 transactivation, and recent data highlight an inhibitory role in TH-17 differentiation.14 Here, we investigate STAT1 control of TH-17 responses during experimental arthritis and determine the role of gp130-regulated IL-17A in arthritis pathology. The generation of gp130F/F and gp130F/F compound mutant mice homozygous null for Stat1 (gp130F/F:Stat1−/−) or Il17a (gp130F/F:Il17a−/−) and heterozygous for the Stat3 (gp130F/F:Stat3+/−) genes have been described previously.15 ,16 Mice were bred and maintained under specified pathogen-free conditions. Splenic T-cells were cultured in RPMI-1640 supplemented with 10% (v/v) foetal calf serum (FCS), 2 mM L-glutamine, 100 U/mL penicillin, 100 µg/mL streptomycin, 1 mM sodium pyruvate and 50 µM 2-mercaptoethanol (all from Life Technologies). A total of 1×105 cells/well were cultured in 96-well plates, and T-cells activated by plate-bound anti-CD3 (1 µg/mL; 45-2C11; R&D Systems) and soluble anti-CD28 (5 µg/mL; 37.51; BD Biosciences). Cultures were supplemented with TGF-β (1 ng/mL; R&D Systems) and IL-6 (10 ng/mL; R&D Systems) and incubated at 37°C for 4 days before evaluation of TH-1 and TH-17 polarisation by flow cytometry (see online supplementary methods). Experiments were performed on 8–12-week-old mice in accordance with UK Home Office Project License PPL-30/2361. Antigen-induced arthritis (AIA) was induced as previously described and disease severity determined by histological assessment of knee-joint sections.13 See online supplementary methods for further details. Disease activity was statistically evaluated using the non-parametric Mann–Whitney U test. Otherwise, differences were determined using an unpaired Student t test. In all cases, p<0.05 was considered significant. We have previously shown that gp130F/F mice display exacerbated histopathology in experimental arthritis, as a consequence of elevated STAT3 signalling.13 In this respect, the severity of joint pathology was associated with increased infiltration of synovial IL-17A-producing T-cells.13 Enhanced gp130-mediated STAT3 activity promotes TH-17 differentiation in vitro.16 However, STAT1 activating cytokines (eg, IFN-γ and IL-27) inhibit TH-17 differentiation, and are protective in experimental arthritis.14 ,17 ,18 Thus, a balance between gp130-mediated STAT1 and STAT3 signalling would be predicted to influence the course of disease. To test this, we first considered the impact of STAT1 deletion on TH-17 development in T-cell cultures from gp130F/F:Stat1−/− compound mice (figure 1). 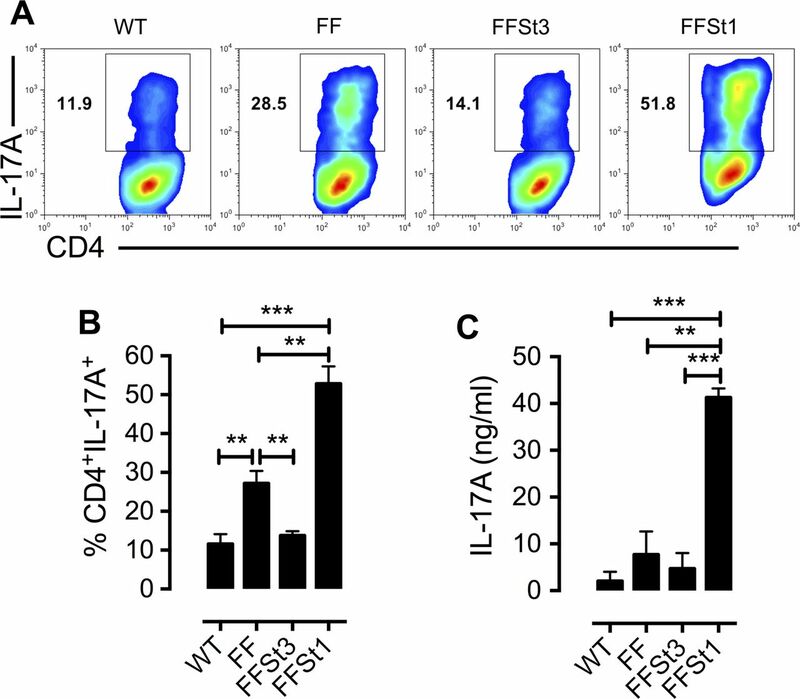 Compared with wild type (WT) controls, T-cells from gp130F/F mice showed more than a twofold increase in the proportion of CD4 IL-17A+ T-cells when cultured under TH-17 polarising conditions (figure 1A,B). This response was STAT3 dependent as the proportion of CD4 IL-17A+ T-cells from gp130F/F:Stat3+/− mice were significantly reduced and TH-17 expansion was comparable with that seen in WT mice (figure 1A,B). Conversely, a loss of STAT1 signalling in gp130F/F:Stat1−/− T-cell cultures caused a ‘hyperexpansion’ of TH-17 cells (figure 1A,B), which was further reflected by the quantification of IL-17A in culture supernatants (figure 1C). While no differences were observed in the frequency of IFN-γ-producing TH-1 cells between the genetic strains, the proportion of IFN-γ+IL-17A+ double producers was elevated in gp130F/F:Stat1−/− T-cell cultures (see online supplementary figure S1). Thus, altered bioavailability of gp130-mediated STAT1 and STAT3 signalling dramatically skews TH-17 commitment in vitro. T-cells from gp130F/F:Stat1−/− mice are hyper-responsive to TH-17 polarisation. (A) Representative flow cytometric analysis of the development of IL-17A producing CD4 T-cells from (WT), gp130F/F (FF), gp130F/F:Stat3+/− (FFSt3) and gp130F/F:Stat1−/− (FFSt1) mice cultured under TH-17 polarising conditions (TGF-β and IL-6). (B) Percentage of CD4 IL-17A+-producing cells generated under TH-17 polarising conditions for each mouse genotype (C) ELISA measurements of IL-17A protein concentrations in splenic T-cell culture supernatants. Data are presented as mean±SD of three independent experiments (**p<0.01, ***p<0.001). WT, wild type. To determine the in vivo consequence of STAT1 deletion in experimental arthritis, AIA was established in gp130F/F:Stat1−/− mice (figure 2). On day 10 of arthritis induction, inguinal lymph nodes were isolated and the number of TH-17 cells compared with those observed in gp130F/F and WT mice (figure 2A). Here, gp130F/F:Stat1−/− mice displayed a heightened peripheral TH-17 response, reflecting our in vitro observations and supporting a role for STAT1 as a negative regulator of TH-17 expansion in vivo. The increased peripheral response was not, however, limited to TH-17 cells as gp130F/F:Stat1−/− mice also displayed elevated total CD4 and TH-1 cell numbers (figure 2A). While gp130F/F:Stat1−/− mice displayed an increased expansion in absolute TH-1 and TH-17 cell numbers compared with WT and gp130F/F mice, the proportion of CD4 T-cells secreting IFN-γ and IL-17A was comparable between genotypes (figure 2A and see online supplementary table S1). This increase in peripheral T-cell commitment did not, however, equate to worse joint pathology during the T-cell prominent phase of the model (day-10). While gp130F/F mice displayed exacerbated disease, gp130F/F:Stat1−/− mice showed attenuated histopathology and scores were comparable with WT mice (figure 2B). Also, immunohistochemistry (IHC) for synovial CD3 T-cells demonstrated a dramatic reduction of infiltrates in gp130F/F:Stat1−/− mice compared with gp130F/F joints (IHC CD3 score of 1.2±0.4 compared with 3.5±0.4 respectively; figure 2C). Synovial STAT1 signalling therefore contributes to gp130-driven joint inflammation. These findings illustrate two contrasting STAT1 activities for the control of T-cell responses, where STAT1 negatively regulates peripheral T-cell expansion, but supports local effector cell recruitment. Heightened peripheral TH-17 cell responses in gp130F/F:Stat1−/− mice during antigen-induced arthritis (AIA) is not associated with exacerbated joint pathology. (A) AIA was established in wild type (WT), gp130F/F (FF) and gp130F/F:Stat1−/− (FFSt1) mice and the number of peripheral CD4, TH-17 and TH-1 cells assessed by flow cytometry of inguinal lymph nodes at 10 days postarthritis induction. Representative dot plots indicating the percentage of IFN-γ (TH-1) and IL-17A (TH-17) producing T-helper cells are also shown. (B) Histological evaluation of joint pathology. Values are presented for individual joints taken at day 10 post AIA (*p<0.05, **p<0.01). Representative parasagittal knee-joint sections stained with haematoxylin, Safranin-O and Fast Green are shown for WT, FF and FFSt1 mice (scale bars, 500 µm). (C) Evaluation of synovial CD3 T-cell infiltration by immunohistochemistry in WT, FF and FFSt1 synovial tissue (scale bars 200 µm). Quantification of staining is also presented. Values represent mean±SD (n=8/4/5 for WT/FF/FFSt1 mice, respectively). We previously observed an association between joint infiltrating IL-17A producing T-cells and exacerbated AIA in gp130F/F mice.13 While gp130F/F:Stat1−/− mice displayed exaggerated peripheral T-cell responses, the failure to recruit these cells to the inflamed joint during AIA prevented us from determining the contribution of TH-17 cells to local joint pathology. We therefore generated gp130F/F:Il17a−/− compound mice to investigate the importance of the TH-17 signature cytokine, IL-17A, in local joint pathology. Consistent with our previous data,13 end-stage histopathology (day-28 & 35) was exacerbated in AIA challenged gp130F/F mice (see online supplementary table S2). However, comparison of gp130F/F and gp130F/F:Il17a−/− mice showed no significant differences in arthritic index, inflammation, exudate, hyperplasia or erosion (figure 3A,B). Therefore, IL-17A has minimal impact in local joint pathology during inflammatory arthritis in gp130F/F mice. 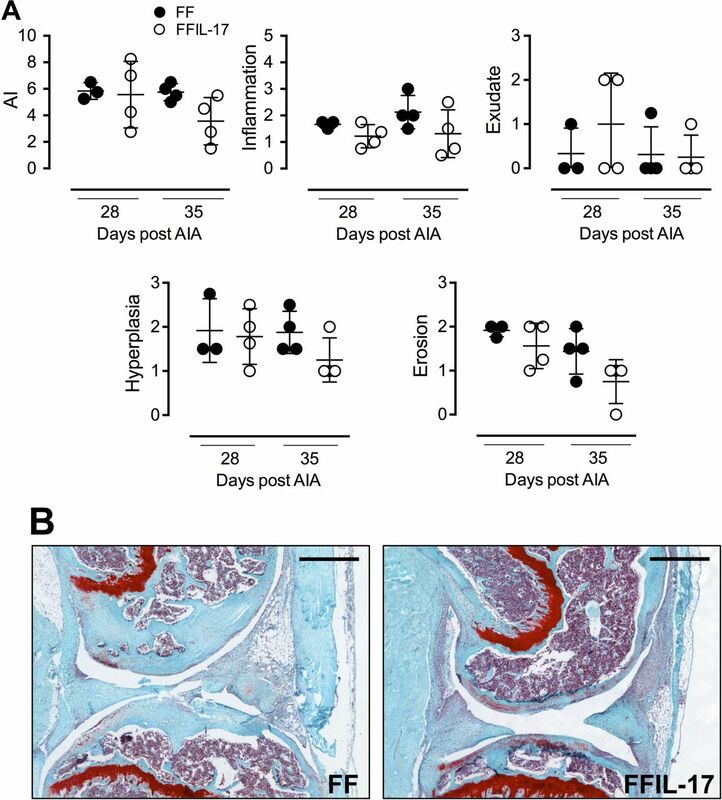 Antigen-induced arthritis (AIA) pathology in gp130F/F mice is independent of IL-17A. (A) Evaluation of arthritic index (AI), inflammation, exudate, hyperplasia and erosion scores in histological joint sections from gp130F/F (FF, closed circles) and gp130F/F:IL-17−/− (FFIL-17, open circles) joint sections. Values are presented for individual joints taken at day 28 and day 35 post AIA. (C) Representative haematoxylin, Safranin-O and Fast Green stained parasagittal joint sections taken on day-28 for FF and FFIL-17 mice (scale bars, 200 μM). Graphs represent mean±SD. While IL-17A and TH-17 cells are associated with the progression of autoimmune diseases, IL-17A targeted therapies have delivered contrasting clinical outcomes. Inhibition of IL-17A in psoriasis is extremely promising,4 ,5 but less favourable results have come from trials in rheumatoid and psoriatic arthritis.19 ,20 Such varied clinical outcomes may reflect the nature of the underlining pathology and infer mechanistic differences in disease progression. To appreciate TH-17/IL-17A involvement in inflammatory arthritis we used the gain-of-function gp130F/F knock-in mouse model, which display enhanced IL-6/gp130-mediated TH-17 commitment, increased IL-17A expression and severe AIA pathology.13 These responses are attributed to enhanced and prolonged gp130-driven STAT1 and STAT3 activation. Importantly, deregulated gp130/STAT3 signalling is associated with experimental models of autoimmunity and cancer. Here, polymorphisms in several IL-6/STAT3 target genes are considered risk factors for RA.21 Critically, STAT1 often opposes the action of STAT3 (termed cross-regulation). Our results reinforce this, with STAT1 negatively regulating the STAT3 control of TH-17 cells in vitro. Prior AIA experiments comparing gp130F/F with gp130F/F:Stat3+/− mice show that a partial STAT3 deficiency ameliorates disease.13 We therefore postulated that gp130F/F:Stat1−/− mice would display severe joint pathology. Although gp130F/F:Stat1−/− mice showed heightened peripheral effector T-cell characteristics, joint inflammation in gp130F/F:Stat1−/− mice closely resembles that seen in gp130F/F:Stat3+/− mice. Thus, STAT1/STAT3 cross-regulation appears to more prominently impact peripheral adaptive immunity. Both STAT1 and STAT3 control chemokine-directed T-cell trafficking to inflamed tissue. STAT1 induces CXCR3 expression on CD4 T-cells22 and local expression of CXCR3 ligands CXC-chemokine ligand (CXCL)9, CXCL10 and CXCL11.23 ,24 Similarly, gp130/STAT3 activity controls inflammatory chemokine expression and IL-6−/− mice show impaired T-cell infiltration and reduced T-cell CC-chemokine receptor (CCR)3, CCR5 and CXCR3 expression.25 Here, STAT1 and STAT3 did not drive a selective trafficking of defined T-cell subsets, but instead regulated all T-cell recruitment.25 We therefore generated gp130F/F:Il17a−/− mice to investigate TH-17-driven joint pathology in gp130F/F mice. Critically, IL-17A did not majorly contribute to the pathology seen in gp130F/F mice, and data were consistent with results from inflammation-associated gastric tumourigenesis in gp130F/F mice, where tumour progression was also independent of IL-17A.16 While alternative effector T-cell subsets may contribute to gp130-mediated joint pathology in gp130F/F:Il17a−/− mice, it is also possible that other TH-17 effector cytokines (eg, IL-17F, GM-CSF) substitute for IL-17A.1 ,26 ,27 Such findings may reflect recent trials in RA where secukinumab (anti-IL-17A mAb) failed to meet its clinical endpoint.19 ,20 The clinical efficacy of a dual targeting strategy for IL-17A/IL-17F (eg, brodalumab - the anti-IL-17 receptor A mAb) remains to be determined. Loss of STAT1 or STAT3 activity had a profound effect on gp130-driven AIA, whereas loss of IL-17A had minimal impact on disease. Therefore, gp130/STAT signalling regulates T-cell responses through control of T-cell effector functions and may determine the severity of local synovial inflammation by driving T-cell trafficking. In summary, our results illustrate that peripheral markers of inflammatory disease may not correlate with local pathology and can be an inadequate predictor of disease severity or local joint pathology. When reflecting on clinical blockade of IL-17A,4 ,5 ,19 ,20 our findings may be relevant in determining the contrasting efficacy of drugs like secukinumab in psoriasis and RA. The authors would like to thank Louise McLeod and Eva Vidacs for technical assistance and Lesley Wiadrowski at the MIMR Histology Facility for expertise.
. Targeting IL-17 and TH17 cells in chronic inflammation. Nat Rev Drug Discov 2012;11:763.
. LY2439821, a humanized anti-interleukin-17 monoclonal antibody, in the treatment of patients with rheumatoid arthritis: a phase I randomized, double-blind, placebo-controlled, proof-of-concept study. Arthritis Rheum 2010;62:929.
. Effects of AIN457, a fully human antibody to interleukin-17A, on psoriasis, rheumatoid arthritis, and uveitis. Sci Transl Med 2010;2:52ra72.
. Anti-interleukin-17 monoclonal antibody ixekizumab in chronic plaque psoriasis. N Engl J Med 2012;366:1190.
. Brodalumab, an anti-interleukin-17-receptor antibody for psoriasis. N Engl J Med 2012;366:1181.
. Th17 cells, but not Th1 cells, from patients with early rheumatoid arthritis are potent inducers of matrix metalloproteinases and proinflammatory cytokines upon synovial fibroblast interaction, including autocrine interleukin-17A production. Arthritis Rheum 2011;63:73.
. Human interleukin-17: A T cell-derived proinflammatory cytokine produced by the rheumatoid synovium. Arthritis Rheum 1999;42:963.
. IL-17 in synovial fluids from patients with rheumatoid arthritis is a potent stimulator of osteoclastogenesis. J Clin Invest 1999;103:1345.
. Th17 functions as an osteoclastogenic helper T cell subset that links T cell activation and bone destruction. J Exp Med 2006;203:2673.
. The role of T-cell interleukin-17 in conducting destructive arthritis: lessons from animal models. 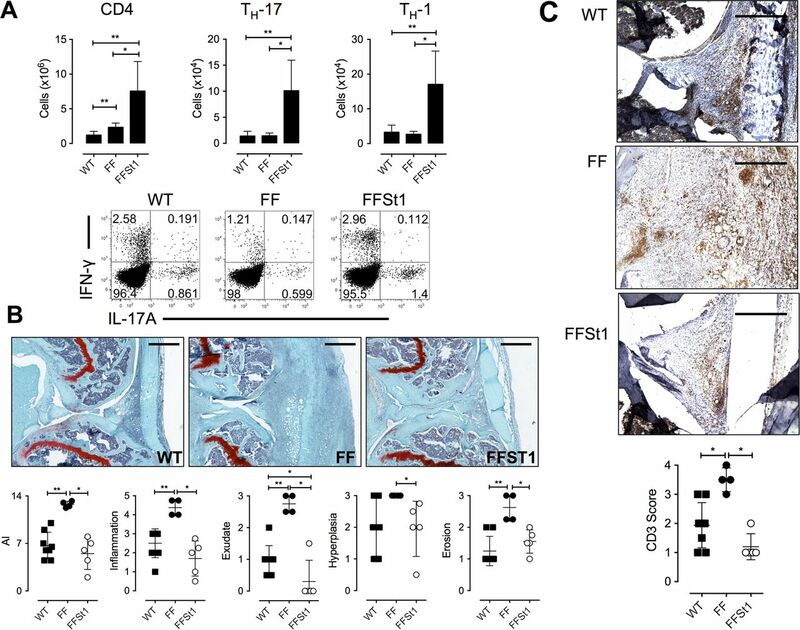 Arthritis Res Ther 2005;7:29.
. TGFbeta in the context of an inflammatory cytokine milieu supports de novo differentiation of IL-17-producing T cells. Immunity 2006;24:179.
. Principles of interleukin (IL)-6-type cytokine signalling and its regulation. Biochem J 2003;374:1.
. Therapeutic targeting of IL-6 trans signaling counteracts STAT3 control of experimental inflammatory arthritis. J Immunol 2009;182:613.
. STAT1-activating cytokines limit Th17 responses through both T-bet-dependent and -independent mechanisms. J Immunol 2010;185:6461.
. STAT3 and STAT1 mediate IL-11-dependent and inflammation-associated gastric tumorigenesis in gp130 receptor mutant mice. J Clin Invest 2008;118:1727.
. The molecular pathogenesis of STAT3-driven gastric tumourigenesis in mice is independent of IL-17. J Pathol 2011;225:255.
. Interleukin 27 attenuates collagen-induced arthritis. Ann Rheum Dis 2008;67:1474.
. Interferon-gamma protects against the development of structural damage in experimental arthritis by regulating polymorphonuclear neutrophil influx into diseased joints. Arthritis Rheum 2007;56:2244.
. Secukinumab (AIN457), a novel monoclonal antibody targeting IL-17A demonstrates efficacy in active rheumatoid arthritis patients despite stable methotrexate treatment: results of a phase IIb study. Arthritis Rheum 2011;63(Suppl 10):401.
. Genome-wide association study meta-analysis identifies seven new rheumatoid arthritis risk loci. Nat Genet 2010;42:508.
. IFN-gamma and STAT1 are required for efficient induction of CXC chemokine receptor 3 (CXCR3) on CD4+ but not CD8+ T cells. Blood 2007;110:2215.
. IL-18 enhances IFN-gamma-induced production of CXCL9, CXCL10, and CXCL11 in human keratinocytes. Eur J Immunol 2007;37:338.
. STAT1 in peripheral tissue differentially regulates homing of antigen-specific Th1 and Th2 cells. J Immunol 2006;176:4959.
. IL-6 trans-signaling via STAT3 directs T cell infiltration in acute inflammation. Proc Natl Acad Sci USA 2005;102:9589.
. RORγt drives production of the cytokine GM-CSF in helper T cells, which is essential for the effector phase of autoimmune neuroinflammation. Nat Immunol 2011;12:560.
. Differential roles of interleukin-17A and -17F in host defense against mucoepithelial bacterial infection and allergic responses. Immunity 2009;30:108. Contributors GWJ, CJG, JOW, MAN and ASW performed the experiments and analysed data. BJJ and SAJ funded experiments. GWJ, CJG, BJJ and SAJ conceived experiments, interpreted data and wrote the manuscript. Funding Research funding was provided by Arthritis Research UK fellowships 19234 and 20305 (to GWJ) and grants 19796, 19381, 18286 (to SAJ), the National Health and Medical Research Council of Australia (to BJJ), as well as the Operational Infrastructure Support Program by the Victorian Government of Australia (to BJJ). BJJ is recipient of a Senior Medical Research Fellowship from the Sylvia and Charles Viertel Foundation.